Choose correct ceramic or titanium adapter and connect to enail. Secure adapter finger tight only. Heat causes a slight expansion and may need to be fingered tightened after time. Connect Enail to Launch Pad, or XLR controller securely. Plug power cord to controller and plug into power source. Hold power button for 3-5 seconds or until screen lights up. Adjust temperature to your preference. 575- 640 degrees on screen will provide a starting point. Everyone has their preference, so adjust by small amounts until you achieved desired effect. Note, based on design, the screen temp is not the actual dish temperature. The dish temperature will always be lower than screen. These are not designed to show the dabbing temperature, but are made to hold a consistent temperature, temps are not read at the dish. 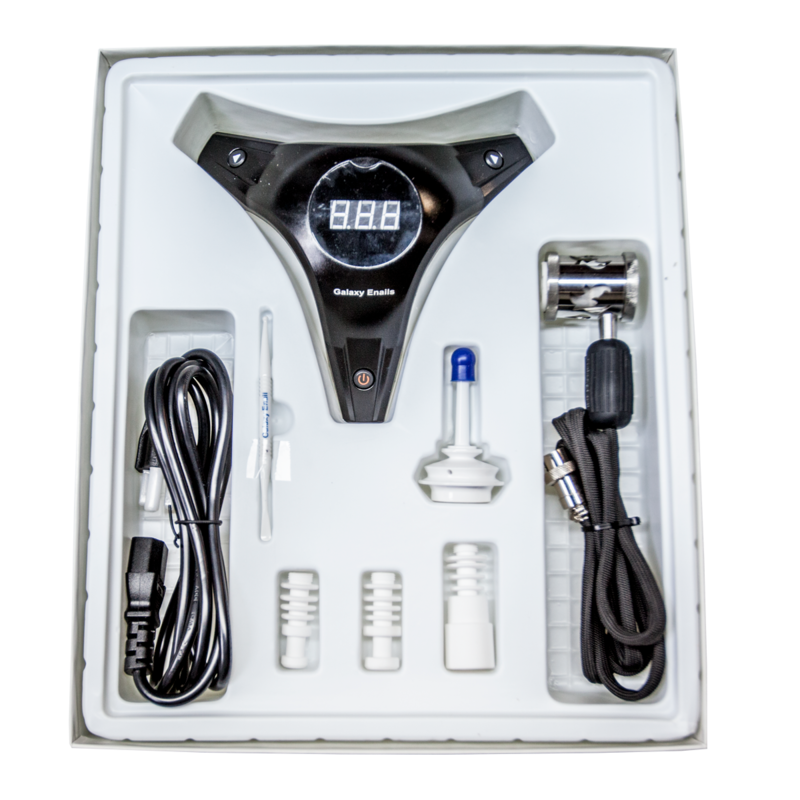 Lower temperatures will provide a better flavor while higher temperatures will vaporize much more, quickly. We recommend by adjusting every 10-20 degrees, allow to heat or cool, until you find your desired temperature. For Safety, Launch Pad Controllers have an auto shut off. The unit will automatically turn off after 90 minutes of use. To override, simply adjust temperature up or down and it will reset the auto shut off timer. Note, some units switch between Celsius and Fahrenheit, When power is on, touch the power button once, if it switches, it goes from C to F. Touch again to bring back unit to your desired setting. XLR controllers do not have auto shut off, and are in F only. Cleaning: Use a small amount of Dark Matter Resin Remover for best results. Qtip dry, or use ISO ALCOHOL to clean dish, when dish is not hot. Excessive heat may shorten overall life of enail. Do Not Run over 750-800 degrees at any time. Do not get heater wet at any time. Choose correct ceramic or titanium adapter and connect to enail. Secure adapter Finger tight only. Heat causes a slight expansion and may need to be fingered tightened after time. Connect Enail to Temperature Controller securely. Plug power cord to controller and plug into power source. Hold power button for 3-5 seconds or until screen lights up. Adjust temperature to your preference. 630-670 degrees on screen will provide a starting point. Everyone has their preference, so adjust by small amounts until you achieved desired effect. Note, based on design, the screen temp is not the actual dish temperature. The dish temperature will always be lower than screen. These are not designed to show the dabbing temperature, but are made to hold a consistent temperature. Lower temperatures will provide a better flavor while higher temperatures will vaporize much more, quickly. We recommend by adjusting every 10-20 degrees until you find your temperature. For Safety, there is an auto shut off on Launch Pad Temperature controllers. That controller will automatically turn off after 90 minutes of use. To override, simply adjust temperature up or down and it will reset the auto shut off timer. Note, some units switch between Celsius and Fahrenheit, When power is on, touch the power button once, if it switches, it goes from C to F. Touch again to bring back unit to your desired setting. XLR Controllers will not have those features. Cleaning: Use a small amount of Dark Matter Resin Remover for best results. Excessive heat may shorten overall life of enail. Do Not Run over 750-800 degrees at any time. Do not get heater wet at any time. Choose correct titanium adapter and connect to enail. Secure adapter finger tight only. Heat causes a slight expansion and may need to be tightened after time. Connect Enail to Temperature Controller securely. Plug power cord to controller and plug into power source. Hold Center, Power Button for 3-5 seconds or until screen lights up. Adjust temperature to your preference. 630-670 degrees on screen will provide a starting point. Everyone has their preference, so adjust by small amounts until you achieved desired effect. Note, based on design, the screen temp is not the actual dish temperature. The dish temperature will always be lower than screen. These are not designed to show the dabbing temperature, but are made to hold a consistent temperature. Lower temperatures will provide a better flavor while higher temperatures will vaporize much more, quickly. We recommend by adjusting every 10-20 degrees until you find your temperature. Cleaning: Use a small amount of Dark Matter Resin Remover for best results. Excessive heat may shorten overall life of enail. Do Not Run over 750-800 degrees at any time. Do not get heater wet at any time. The Milky Way collector uses water to cool the vapor. Just a small amount of water is needed to function properly (less than a tablespoon). Fill and test water level before connecting other components. Glass is designed to be spill proof. Excess water can be blown out carefully. Dry Glass off of any excess water. Secure ceramic tip with clip, or titanium tip, for torch application. Torch Version: Titanium tips work best for torching, while Ceramic tips are best designed for the electric 8mm coil. Ceramic Tips can also be torched. Determine correct fitting of 6-1 Titanium Adapter. To connect coil, unsecure top of Titanium Adapter. Put Flat Heater Coil on Adapter and put Quartz Dish on top of coil. Secure with top. Note, there should be a little room to allow for expansion of coil when ON. If using Quartz Coated Ceramic Dish, put ceramic washer below heater for best fit of heater. Plug Enail into controller, plug power cord to controller and into power source. Hold center button down for 3-5 seconds until screen lights up. Start with 680-700 and adjust temperature as needed, until you find your preference. Adjust every 10-20 degrees until desired effect is achieved. Cleaning: Use a small amount of Dark Matter Resin Remover for best results, or ISO ALCOHOL over 91% Excessive when enail is not on. Excess heat may shorten overall life of enail. Do Not Run over 750-800 degrees at any time. Do not get heater wet at any time. 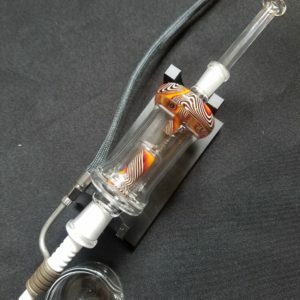 Connect Coil Heater onto Quartz Banger. Rest coil on banger post, or silicone banger hanger, properly, and securely. Coil should sit flush with bottom of banger. Small adjustments may need to be made to ensure proper fit. Plug Enail into temperature controller, plug power cord to controller, and into power source. Turn On: Hold center button down for 3-5 seconds until screen lights up. Start with 620-630 and adjust temperature as needed, until you find your preference. Adjust every 10-20 degrees until desired effect is achieved. If puddle occurs, raise temps 15 degrees or so to find lowest temp. Allow for temps to adjust during use. Screen Temps are always higher than dish temps based on design. Cleaning: Use a small amount of Dark Matter Resin Remover for best results or Qtip left over residues as you use enail. Excessive heat may shorten overall life of enail. Do Not Run higher than dabbing temps at any time. Do not get heater wet at any time. Turn OFF: Hold center button down for 3-5 seconds, until unit turns off. Contact Galaxy Enails to troubleshoot or have any issues, or questions. Lifetime Warranty On Controllers, 1 Year or 1 Replacement on Heater coils. Glass and accessories are not covered under warranty. Keep Receipt of purchase if warranty work is needed. 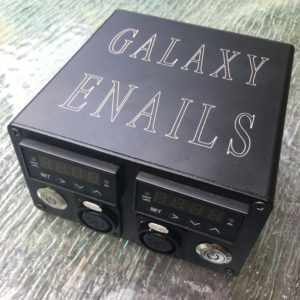 Visit You Tube, search “Galaxy Enail Quartz Banger” for basic product video. Water Attachment: Fill a small amount of water into water attachment. It requires only a small amount, enough to be just above the slits in the glass. Any excess water can be blown down into bottom chamber, then tilt, and pour out. Dry Off any water before putting onto Electric Body. Keep any water away from dish and heater as it will cause a short and void any warranty on the heater or battery. Carefully slide water attachment onto heater and electric body. To operate, click 3 times to start a preheat and running cycle. Make sure to start with a fully charged battery. Battery takes about an hour to fully charge. When plugged in unit shows RED until its charged and it will turn to GREEN. It works best when running a preheat cycle to allow unit to warm up, while preheating, prepare dab, then click 3 more times when Green turns off. Click 3 more times an start dabbing. Smaller dabs may just require 1 cycle, but for normal dabs, 2 cycles is best. Unit will run about 25 cycles before needing a recharge. Its likely to deliver 12-15 good hits, using 2 cycles each hit, before requiring a recharge. Most effective when putting dab in center of dish, closest contact point to the heater. Just be sure to finger tighten the dish onto the heater rod. If not secure, heater rod may not be touching dish and won’t allow unit to heat as intended. Heater also needs to be finger tightened to electric body. If not secure, heater will not heat up. Avoid overspill of the dish, or doing too large of a dab, any excess oils could spill over and make its way down heater rod, causing a short in the heater. We recommend using alcohol wipes to keep heater clean, glass clean, and carb cap clean as it will preform better. 3 lights blinking shows dead batter, or possible heater issue. Keep heaters clean and avoid overspill into heater rod area, may cause short. Heaters do fail, replacement are inexpensive and available. Keep an extra one handy, just in case. Fully Charge prior to use. Plug into wall outlet for best charging. Unit will show RED when charging and will turn GREEN when fully charged. Time may vary depending on charge left in battery. Dead battery may take 2-3+ hours to fully charge. Once Charged, attach heater, finger tight, if not connected. Choose dish and secure finger tight. Heater needs complete contact with electric body and dish needs complete contact with heater rod to work. Add water to glass attachment. Put Glass Attachment onto heater, carefully, at same time, TWIST, Big Ripper and PUSH down on glass to secure attachment. Only hold the glass on part that will cover heater when putting on, adjusting, or removing. To Remove, Carefully, TWIST and PULL to remove glass. PULLING STRAIGHT UP WILL DAMAGE HEATER AND BREAK HEATER 510 CONNECTION. Dry any excess before putting on over heater. Secure water attachment to heater. Glass joints are weak and may break if handled differently. 3 Clicks, medium speed, starts a preheat and running cycle. These work best when running 1 cycle allowing unit to preheat before dabbing. Prepare dab while preheat cycle runs. Click 3 clicks when GREEN light turns off and start second cycle. Dab during RED preheat or Green cycle. Apply dab to center of dish, closest point to heater rod. Seems to work best when drawing slowly and restricting air flow of carb cap when dabbing. 3 lights blinking and no heat may have a heater issue. Keep heaters clean and avoid overspill into heater rod area, may cause short. Heaters can and do fail, replacements are inexpensive and available. Keep an extra one handy, just in case. We recommend using alcohol wipes to keep heater clean, glass clean, and carb cap clean as it will preform better. E-nail style with issue: Odyssey, Mini, Quartz Hybrid, or Quartz Banger? Help keep your dish clean, Q-Tip excess residues as you use the enail. Do Not use Dark Matter when enail is ON or HOT. When enail is cold, or off, carefully pour a small amount of cleaner into the dish. Try just enough to cover the bottom of the dish. It’s not necessary However, If you are prone to accidents, you can remove dish from coil and housing, or use a dropper to apply small amounts of cleaner onto dish. Just a small amount needs to be used. Allow Dark Matter to soak, at least 15-20 minutes. Best results are achieved with an overnight soak, if needed. Do not get any cleaner onto heater or heater assembly as it may void the warranty coverage. This all natural formula contains no alcohol and enail can be used right away without any adverse effects to flavor. After its soaks, pour out, or Q tips out the residue left behind. Some instances may require additional scraping as abrasiveness helps to remove excess residues left behind. “Dark Matter” is all that will be left behind.